Apache Stainless Equipment Corporation, a manufacturer of capital equipment, promotes manufacturing careers and is recognized by DWD Secretary Newson on the partnership with area schools and collaborators in supporting Youth Apprentices. I applaud Apache Stainless Equipment in their ongoing effort to collaborate with the local school district and other partners to give Youth Apprentices experience and consideration for future employment. On Nov. 26, Apache Stainless Equipment Corporation hosted Dept. of Workforce Development Secretary Newson along with Beaver Dam school board members. Pam Korth, Apache’s Human Resource Manager and Joe Kutzler, the Beaver Dam High School Industrial Tech teacher gave a presentation and talked to the group about the Youth Apprenticeship Program and the continuing need to increase awareness for careers in manufacturing. "Companies like Apache Stainless Equipment are participating in our Youth Apprenticeship program and filling their need for skilled workers, and at the same time helping area students obtain quality workplace training," said Secretary Newson. "I applaud Apache Stainless Equipment in their ongoing effort to collaborate with the local school district and other partners to give Youth Apprentices the opportunity to gain experience and be considered for potential future employment." Michael Gerschke, Apache’s current Youth Apprentice, came to the presentation to tell the group about the different skills that he is learning. Michael explained that he spends two to three weeks in every manufacturing area throughout the year long program. Nick Buchda who was a Youth Apprenticeship graduate more than 16 years ago spoke about his career path at Apache. He explained that he started out in welding and worked in estimating and engineering support before he was promoted to sales. Korth and Kutzler also works closely with the Manufacturing Business Alliance of greater Dodge County area. "The Manufacturing Business Alliance was created by manufacturers such as Apache Stainless to promote jobs that leverage technology, create paths for career growth, offer continuing educational opportunities and have collaborative environments such as Youth Apprenticeship,” Korth said. Kutzler, Technology and Engineering Educator for the school district, said, "We offer the Youth Apprenticeship program to students to give them guidance, mentoring and an opportunity to start a career that requires a skill that is rewarding to them, and the companies they work for. Companies that support these programs and work with schools in their community will find that there are not only getting a quality workforce but helping build a strong community as well." 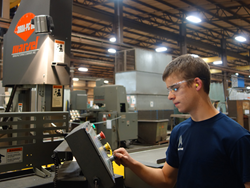 From the Department of Workforce Development: Wisconsin’s Youth Apprenticeship program combines on-the-job training with technical college-level instruction at the participant's local high school. Those who complete the program receive a completion certificate, may receive technical college credit, and graduate with the skills and competencies need to accept an entry-level position in their field of study. In December 2013, Governor Walker signed 2013 Wisconsin Act 112, which increased state Youth Apprenticeship funds by $1 million in the current biennium. Apache Stainless Equipment Corporation, located in Beaver Dam, Wisconsin, is a manufacturer of capital equipment including large stainless ASME tanks, carbon steel tanks and equipment, small / portable vessels, contract manufacturing and the Mepaco line of food processing equipment.